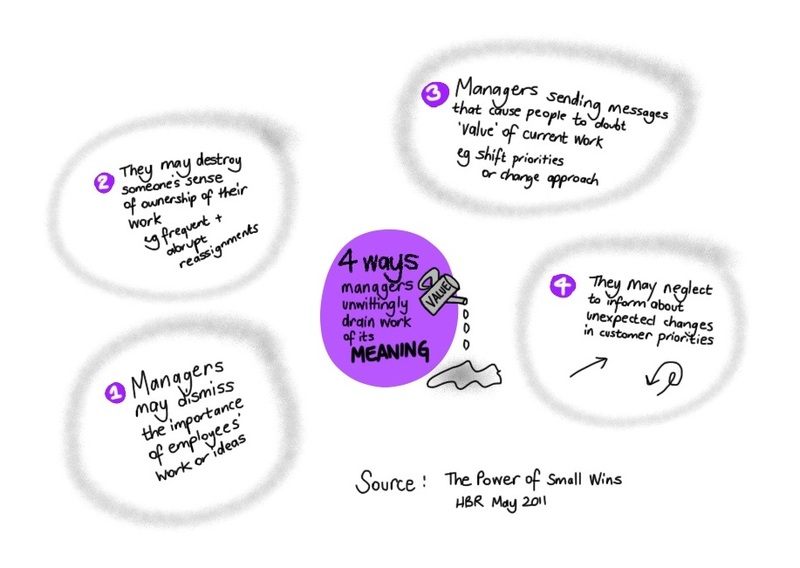 In their May 2011 HBR article entitled, ‘The Power of Small wins’ – the progress principle, Professors Amabile and Kramer share their findings about what actions can unwittingly drain work of its meaning. Did you take the time to really consider the idea presented by a team member today – before you dismissed it or chose your own? Did you take someone off an assignment that they had been working on for a while / felt a strong connection to – and reallocate them elsewhere? Did you change the priorities in some way – even subtly? Did you direct your attention to the ‘new’ shiny thing? Did you explain to the team the reasons behind the shift in customer priorities? Some of these changes make good business sense. There may be times when we need to alter our focus to help achieve our outcomes. We may need to reprioritise and reallocate resources to help us move closer to achieving our goals. But make sure we make these changes with the knowledge of what it may do to the ‘meaningful work’ our people are doing – and have a compelling argument that helps to give new meaning to what they are contributing to. Want to see another blog on a similar topic? Click here.